I am happy to meet you in this historic Procathedral of Santa Maria, which over the years has seen countless celebrations of the sacrament of marriage. Looking at you, so young, I wonder: but then what they say is not true, that young people do not want to get married? Thank you! Getting married and sharing life is a beautiful thing. There is a saying in Spanish that says: "Pain in two, half pain; joy in two, a joy and a half ". This is the path of marriage. How much love has been manifested, how many graces have been received in this sacred place! I thank Archbishop Martin for his cordial welcome. I am particularly happy to be with you, engaged couples and spouses who are in different stages of the path of sacramental love. It is also nice to hear that music that comes from there: children who cry ... That is a hope, it is the most beautiful music; but also the most beautiful sermon, to hear a crying child, because it is the cry of hope, that life continues, that life goes on, that love is fruitful. Looking at the children ... But I also greeted an elderly person: we must also look at the elderly, because the elderly are full of wisdom. Listening to the elderly: "How was your life? ...". I liked this, that it was you [addressing the elderly couple who spoke first] to start, after 50 years of marriage, because you have so much experience to share. The future and the past meet in the present. They, the old ones - allow me the word: the old, the old - have the wisdom. Even the mother-in-law have the wisdom ... [laughs, laughs]. And children must listen to wisdom, you young people must listen to wisdom, and talk with them to go on, because they are the roots. They are the roots, and you take from the roots to move on. This I will certainly say later, but I have to say it from the heart. In a special way, as I said, I am grateful for the testimony of Vincent and Teresa, who told us about their experience of fifty years of marriage and family life. Thank you both for your words of encouragement and for the challenges you have presented to new generations of newlyweds and boyfriends, not only here in Ireland but all over the world. They will not be like you, they will be different. But they need your experience to be different, to go further. It is so important to listen to the elderly, listen to grandparents! We have much to learn from your experience of married life supported every day by the grace of the sacrament. I want to ask you: did you fight a lot? But this is part of the marriage! A marriage in which you do not fight is a bit 'boring ... [laugh] But there is a secret: they can also fly the dishes, but the secret is to make peace before the day ends. And to make peace it is not necessary a speech, just a caress, so, and peace is made. And do you know why it's important? Because if you do not make peace before going to bed, the "cold war" of the next day is too dangerous, the grudge begins ... Yes, fight as long as you want, but in the evening make peace. Agree? Do not forget it, you young people. Growing together in this community of life and love, you have experienced many joys and, certainly, even a few sufferings. Together with all the spouses who have come a long way along the road, you are the custodians of our collective memory. We will always need your testimony full of faith. It is a precious resource for young couples, who look to the future with emotion and hope ... and also, perhaps, with a pinch of anxiety: how will this future be? I also thank the young couples who have asked me some honest questions. It is not easy to answer these questions! Denis and Sinead are about to embark on a journey of love that, according to God's plan, involves a lifelong commitment. They asked how they can help others understand that marriage is not simply an institution but a vocation, a life that goes on, a conscious and lifelong decision to take care, help each other and protect each other. Of course we must recognize that today we are not used to something that really lasts for a lifetime. We live a culture of the temporary, we are not used to it. If I feel hungry or thirsty, I can feed myself, but my feeling of being full does not last even a day. If I have a job, I know I could lose it against my will or that I might have to choose a different career. It is difficult even to keep up with the world, as everything around us changes, people come and go in our lives, promises are made but often they are broken or left unfinished. Perhaps what you are asking me is actually something even more fundamental: "Is there really nothing precious that can last?". This is the question. It seems like nothing beautiful, no precious thing, it lasts. "But is not there really something precious that can last? Not even love? ". And there is the temptation that that "for life" that you will say to one another, is transformed and, in time, dies. If love does not grow with love, it lasts a little. That "for life" is a commitment to make love grow, because in love there is no provisional. If not, it's called enthusiasm, it's called, I do not know, enchantment, but love love is definitive, it's an "you and me". As we say, it is "half of orange": you are my orange half, I am your orange half. Love is like this: everything and for life. It is easy to remain prisoners of the culture of the ephemeral, and this culture attacks the very roots of our processes of maturation, of our growth in hope and love. How can we experience, in this ephemeral culture, what really lasts? This is a strong question: how can we experience, in this ephemeral culture, what really lasts? Here's what I'd like to tell you. Among all the forms of human fruitfulness, marriage is unique. It is a love that gives rise to a new life. It implies mutual responsibility in transmitting the divine gift of life and offers a stable environment in which new life can grow and flourish. Marriage in the Church, that is, the sacrament of marriage, participates in a special way in the mystery of God's eternal love. When a Christian man and woman unite in the bond of marriage, God's grace enables them to freely promise one another. to the other an exclusive and lasting love. Thus their union becomes a sacramental sign - this is important: the sacrament of marriage - becomes a sacramental sign of the new and eternal covenant between the Lord and his spouse, the Church. Jesus is always present among them. He sustains them throughout life in the mutual gift of self, in fidelity and in indissoluble unity (cf. Gaudium et Spes, 48). The love of Jesus for couples is a rock, it is a refuge in times of trial, but above all it is a source of constant growth in a pure and forever love. Make strong bets for a lifetime. You risk! Because marriage is also a risk, but it is a risk that is worth it. Throughout life, because love is like that. We know that love is God's dream for us and for the entire human family. Please do not ever forget it! God has a dream for us and asks us to do it right. Do not be afraid of that dream! You dream big! Make it a treasure and dream it together every day again. In this way you will be able to support each other with hope, with strength and with forgiveness in times when the path becomes difficult, it becomes difficult to see the way. In the Bible, God commits himself to remain faithful to his covenant, even when we sadden him and our love weakens. What does God say in the Bible to his people? Listen well: «I will not leave you and I will not forsake you» (Hebrews 13: 5). And you, as husband and wife, join each other with these words of promise, every day for the rest of your life. And never stop dreaming! Always repeat in the heart: "I will not leave you, I will not abandon you". Stephen and Jordan are newlyweds and have asked the very important question of how parents can pass on their children's faith. I know that the Church here in Ireland has carefully prepared catechesis programs to educate the faith in schools and parishes. This is certainly essential. But the first and most important place for faith to pass is the home: one learns to believe at home, through the calm and daily example of parents who love the Lord and trust in his word. There, in the house, which we can call the "domestic church", children learn the meaning of fidelity, honesty and sacrifice. They see how mum and dad behave among themselves, how they take care of each other and others, how they love God and the Church. Thus the children can breathe the fresh air of the Gospel and learn to understand, judge and act in a way worthy of the faith they have inherited. Faith, brothers and sisters, is transmitted around the table at home, at home, in ordinary conversation, through the language that only persevering love can speak. Never forget, brothers and sisters: faith is transmitted in dialect! The dialect of the house, the dialect of domestic life, there, of family life. Think of the seven Maccabee brothers, as the mother spoke to them "in dialect", that is, what they had learned about God as children. It is more difficult to receive faith - it can be done, but it is more difficult - if it has not been received in that mother tongue, at home, in dialect. I am tempted to talk about my experience as a child ... If I need it, I say it. I remember once - I was five years old - I went home and there, in the dining room, dad came from work, at that moment, before me, and I saw dad and mom kissing each other. I never forget it! What a nice thing! Tired of work, but had the strength to express love to his wife! May your children see you this way, that you caress, kiss, embrace; this is beautiful, because they learn this dialect of love, and faith, in this dialect of love. Therefore, it is important to pray together in the family; talk about good and holy things; and let Mary our Mother come into your life, family life. Celebrate Christian holidays: let your children know what a family party is. Live in deep solidarity with those who suffer and are on the margins of society, and that children learn. Another anecdote. I met a lady who had three children, seven, five and three years old more or less; they were good spouses, they had so much faith and they taught their children to help the poor, because they helped them so much. And once they were at lunch, mother with three children - dad was at work. Knock at the door, and the biggest one goes to open, then comes back and says: "Mom, there's a poor man who asks for something to eat". They were eating Milanese steaks, breaded - they are delicious! [laugh] - and the mother asks her children: "What do we do?". All three: "Yes, mum, give something". There were also some advanced steaks, but Mama takes a knife and starts cutting each of those children in half. And the children: "No, mother, from those, not ours!" - "Ah no: to the poor from yours, not from what advances!". So that woman of faith taught her children to give their own to the poor. But all these things can be done at home, when there is love, when there is faith, when that dialect of faith is spoken. In short, your children will learn from you how to live as Christians; you will be their first teachers in the faith, the transmitters of the faith. The virtues and truths that the Lord teaches us are not always popular in today's world - sometimes, the Lord asks for things that are not popular - today's world has little consideration for the weak, the vulnerable and for all those who believe "unproductive". The world tells us to be strong and independent, caring little for those who are alone or sad, rejected or sick, not yet born or dying. Soon I will go privately to meet some families facing serious challenges and real hardships, but to which the Capuchin Fathers show love and support. Our world needs a revolution of love! The "storm" we live is rather of selfishness, of personal interests ... the world needs a revolution of love. May this revolution start with you and your families! A few months ago someone told me that we are losing our ability to love. Slowly but surely we are forgetting the direct language of a caress, the strength of tenderness. It seems that the word tenderness has been removed from the dictionary. There can not be a revolution of love without the revolution of tenderness! 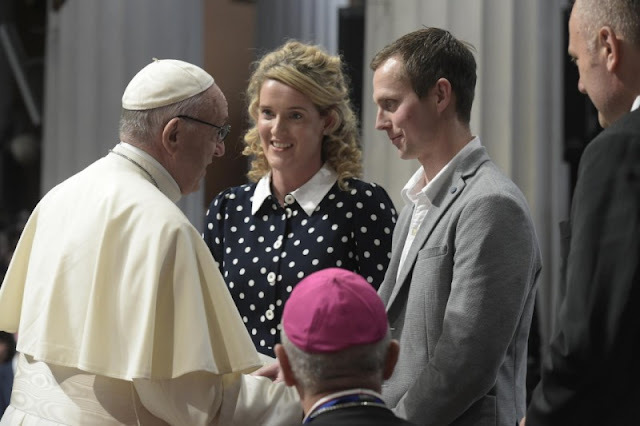 With your example, may your children be guided to become a more caring, loving, faith-filled generation for the renewal of the Church and of all Irish society. Thus your love, which is a gift from God, will sink even deeper roots. No family can grow if it forgets its roots. Children do not grow up in love if they do not learn to communicate with their grandparents. So let your love sink deep roots! Let us not forget that "all that on the tree has flowered / lives on what lies buried" (F. L. Bernárdez, sonnet Si para recobrar lo recobrado). So says an Argentine poem, allow me publicity. Together with the Pope, may the families of the whole Church, represented this afternoon by the elderly and young couples, thank God for the gift of faith and the grace of Christian marriage. For our part, we commit ourselves to the Lord to serve the coming of his kingdom of holiness, justice and peace with fidelity to the promises we have made and with constancy in love! And now, I invite you to pray together for the Family Meeting. Then I will give you the blessing. And I ask you to pray for me, do not forget it!